Sanssouci – which in French means ‘without worries’ – was Frederick the Great refuge in Potsdam, the place where he liked to retreat and relax, away from the pomp and circumstance of the Court. Although often compared to the French Versailles, Sanssouci Palace is smaller and more intimate and a wonderful example of Rococo architecture, transmitting a feeling of lightness and grace in the proportions as well as in the architectural details. 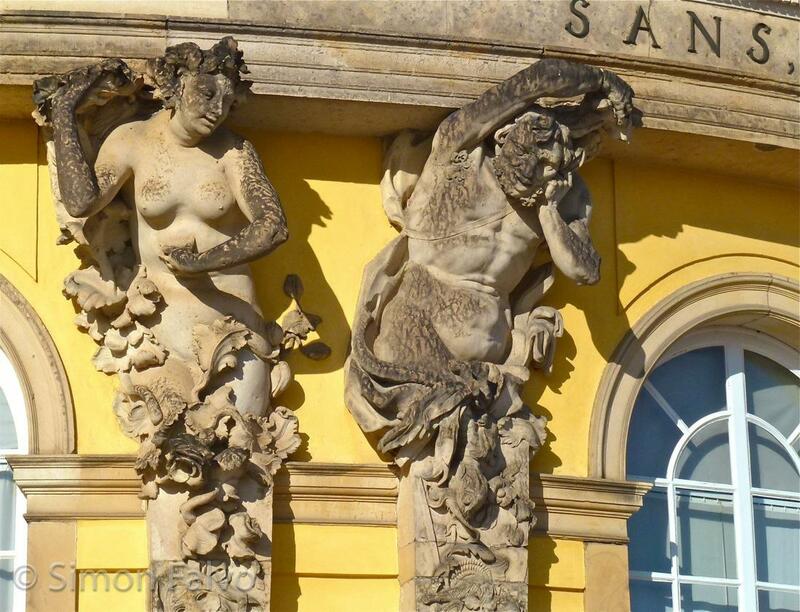 Maybe it’s no accident that the Atlas and Caryatids decorating the garden façade represent Bacchants, the mythological figures followers of Dionysus (Bacchus in the Roman Mythology) and symbolizing ecstasy and the loss of control. I’ve been (unfortunately in the winter) and I know I mentioned the name to people a fair amount, but I never stopped to think what it meant in French. Cool that it means no worries.